Sure Shot BBQ offers good food, makes up for poor decor | Grand Central Magazine | Your Campus. Your Story. One Mount Pleasant spot that I’ve heard a lot about in the last couple years is Sure Shot BBQ. With a convenient location at 1135 South Mission and daily hours of 11 a.m. to 9 p.m., I knew Sure Shot had to be the next local prize to receive a Grand Central review. 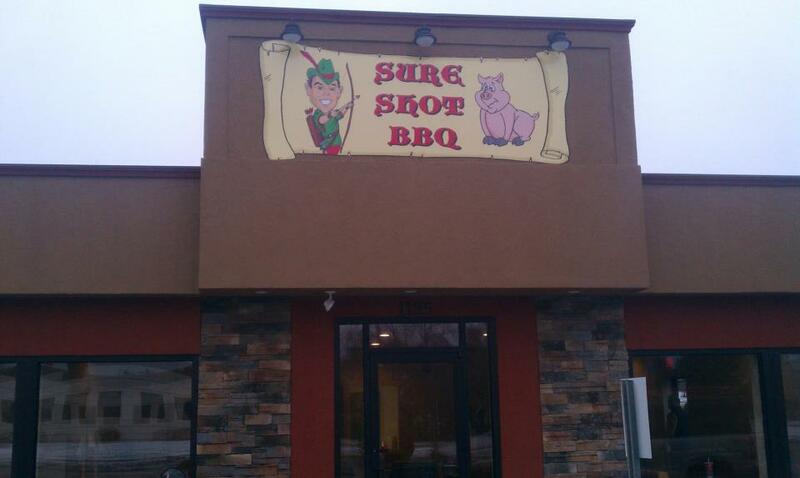 In addition to a great location and being open seven days a week, Sure Shot makes it even easier to satisfy your BBQ cravings by offering both dine-in and carry out options. Upon walking into Sure Shot, the first thing you notice is the lackluster décor. It would make sense for a BBQ joint to have a more functional than fancy feel, but even with that in mind, Sure Shot comes up a little short. To get the full experience I chose to dine-in. After an internal struggle and heavy contemplation, I settled on my order – The Lil’ Jon, with a side of baked beans and a Coke. The Lil’ Jon is a pulled pork sandwich with a thick slice of ham, pickles, and a special sauce that reminded me of some sort of peppercorn mustard. The sandwich cost $8, but could be made into a combo with a side and a soda for just a dollar more. Sides at Sure Shot include baked beans, mac-n-cheese, and of course, coleslaw. When I visited, there was something wrong with the fountain pop machine, so I was restricted to just Coke, Diet Coke or Sprite in can form. I found my way over to my table and my order was brought out to me in what seemed like a few minutes. My mouth watered as I gazed at the pork-stuffed bun and sizeable portion of baked beans. After solving the riddle on how to attack the not so “lil’’ sandwich, the experience began. The pulled pork was deliciously tender and was drenched in a fantastic BBQ sauce that was the perfect amount of sweet. To me, the best accompanying topping to any pulled pork sandwich is pickle, and the ones on the Lil’ Jon did not disappoint. The slice of ham that rested between the pork and pickles served as a great transition between the two flavors. Personally, I’m not a mustard fan at all, but the unique mustard-esque sauce that topped the Lil’ Jon was the ingredient that really brought the sandwich to the next level. The final part of this masterpiece of a sandwich to be mentioned is the luscious bun that supported the fixings. Soft and flaky, yet it didn’t fall apart – perfection. After a few satisfying bites, I dove into my side order. The beans were well baked and included some onion pieces for texture, but the stand out thing about the dish was the surprising spice flavor that was present in every bite. Sure Shot BBQ’s Lil’ Jon sandwich is far and away the best pulled pork sandwich I’ve ever had, but the poor dine-in environment and lack of fountain pop are the main reasons for a less-than-perfect experience. I give Sure Shot BQQ 4 out of 5 stars. Separator image Posted in Drinks, Featured, Food, Food & Beverage, Restaurants and tagged with baked beans, barbeque, Mount Pleasant, pulled pork, review, Sure Shot BBQ.